Imagine "Fahrenheit 9/11" filmmaker Michael Moore and singer Linda Ronstadt onstage in Las Vegas, singing "America the Beautiful" at the very same casino resort where she was booed and told not to come back, because of remarks praising Moore. It could happen - as early as September. That's when the Aladdin is expected to change hands, to a new consortium of owners including Planet Hollywood CEO Robert Earl, in a deal that is mostly done but is awaiting a gambling license. He says he'd invite both Moore and Ronstadt to appear at the hotel, which is to be renamed Planet Hollywood Hotel & Casino. "We respect artists' creativity and support their rights to express themselves," says Earl. "We were very sorry to hear about the unfortunate circumstances of this past Saturday night and want to make it clear that Planet Hollywood has never, in our 13 year history, restricted any artists' right to free speech and we will continue with that policy once we take ownership." Current Aladdin President Bill Timmins had Ronstadt escorted off the property Saturday after her concert because she called Moore a "great American patriot" as she dedicated the song "Desperado" to the outspoken filmmaker. Ronstadt also encouraged the audience of 4,500 people to see "Fahrenheit 9/11", Moore's unflattering documentary about President Bush. She said Moore is "spreading the truth." Timmins, who was in the audience, said Ronstadt's comments irked people and some tore down posters and walked out of the theater angrily. 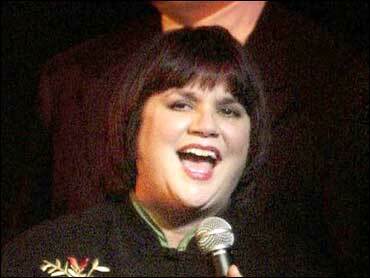 Timmins said Ronstadt would never be allowed to play at the Arabian Nights-themed resort while he was in charge. "A situation like that can easily turn ugly and I didn't want anything more to come out of it," said Timmins, defending his decision in a Las Vegas Sun interview. "There were a lot of angry people there after she started talking." "If she wants to talk about her views to a newspaper or in a magazine article, she is free to do so." said Timmins. "But on a stage in front of four and a half thousand people is not the place for it." Ronstadt told The Los Angeles Times she will continue to praise Moore and doesn't want to play the Aladdin again anyway. "This is an election year. I want people to get their head up out of their mashed potatoes and learn something about the issues and go and vote," said Ronstadt, who mentioned Moore again at her concert in Los Angeles Tuesday, sparking both cheers and about 100 demands for refunds. Ronstadt hasn't yet commented on the idea of appearing with Moore but a friend of the singer tells the Las Vegas Sun he wouldn't be surprised "if Linda, Michael Moore and many of their friends got together for some sort of a benefit concert there." Teaming up with Ronstadt is an idea hatched by Moore himself, in a protest letter posted on his web site and sent to the Aladdin. In it, he notes that many people there cheered Ronstadt in Vegas and suggests that the casino president owes her an apology. Moore also offers to show "Fahrenheit 9/11" free of charge to all of the casino's guests - and "anyone else in Las Vegas who wants to see it."